It is my great pleasure to join you at the reception. I would like to extend my warm welcome to Mr Lu Hao and members of the Chinese youth delegation. I am glad to say that this is the very first delegation from China I have received since I came to London to take up my post three weeks ago. In fact, I hosted Mr Lu and his colleagues in their visit to the DPRK five months ago. It gives me great pleasure to welcome them to London. I must add that my special bonds with the All China Youth Federation went back much longer. Fifteen years ago, I was a member of the National Committee of the All China Youth Federation, so in a sense hosting this delegation for me is like receiving long-separated relatives. Youth exchanges are an important part of our bilateral relationship. 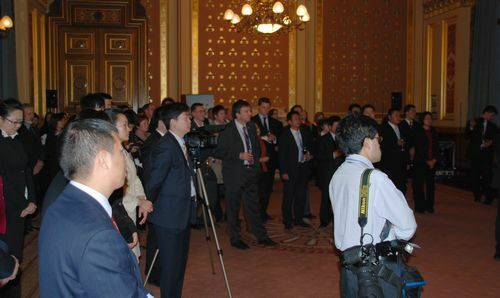 In 2008 Premier Wen Jiabao and Prime Minister Gordon Brown jointly set up a mechanism for regular exchanges between young people of our two countries led by the China All-Youth Federation and the British Council. This is a far-sighted initiative. Recent years have seen a surge in youth exchanges between our two countries. 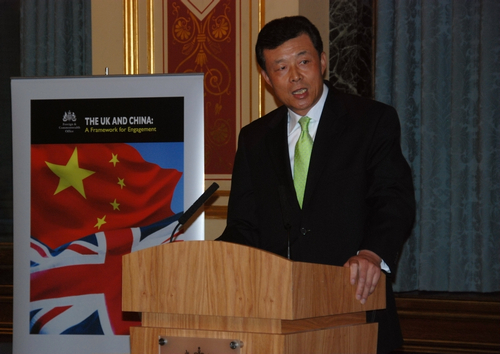 The “UK study fever” that swept China has brought more than 100,000 Chinese students to the UK. There has also emerged a mandarin fever among British young people. I experienced this first hand when I attended the “Chinese Bridge” Chinese Proficiency Competition not long ago. Our common future lies in the hands of the young generation. I sincerely hope that our young people will step up dialogue, increase mutual understanding, and join hands to create a brighter future for China-UK relations. I wish the Chinese youth delegation a successful visit.